Cork Airport will charge drivers dropping off or picking up passengers if it takes longer than 15 minutes. A new barrier system with automatic licence plate recognition is being put in place and access will be free for up to 15 minutes to allow for normal drop off and collection. For drivers who wish to stay beyond that charges – unspecified as yet – will apply. The airport advised drivers who wish to stay longer to use the short-term car park, which is also free for the first 15 minutes. 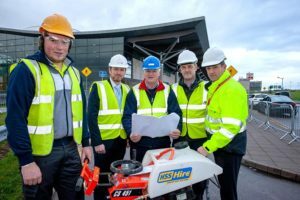 Chris O’Donnell, HBS Construction; Kevin Callaghan, Horgan Lynch Consulting Engineers; Paudie Cronin, HBS Construction Ltd; Brian Culloty, engineer Cork Airport and Adrian Kevane, Duty Manager, Cork Airport. Cork Airport said that “in line with international best practice“, it is also changing the layout of its forecourt and set down area. The outer right-hand lane will continue to be used by private vehicles, for set down and drop off only. The move is part of a new road traffic management system which it said is to facilitate growing passenger numbers. The measures include investment in an upgrade of the forecourt, improved access to car parks, improved signage, a new two-way road system to the Red Express car park and enhanced public transport lanes. Construction will commence immediately following the recent granting of planning permission, with the new system to be fully operational from March. Con Dooney, General Manager Operations and Safety at Cork Airport, said: “Over 2.4m passengers will pass through Cork Airport this year, our third consecutive year of growth, and this will rise again next year by a further 7pc to 2.6m. To cater for this significant increase, we need to make improvements to our roads infrastructure. The new two-way system to the Express Red long-term car park is designed to reduce traffic volumes on the main road towards the terminal. The project also includes road signage improvements for better traffic-flow, and enhanced public transport lanes for taxis and buses. The 226/226A bus connects to the city centre, Parnell Place Bus Station and Kent Railway Station.